Every year, The Great Minnesota Get Together draws almost 2 million fair-goers to Saint Paul over the weeks prior to Labor Day. The Minnesota State Fair, the largest of them all by daily attendance standards, is a massive, sometimes overwhelming, fried food frenzy that has everything from prize pigs to butter sculptures to grandstand concerts. It is a right of passage for Minnesotans. And they know that in order to enjoy the fair to its fullest extent, you need to prepare and go about it like a pro. 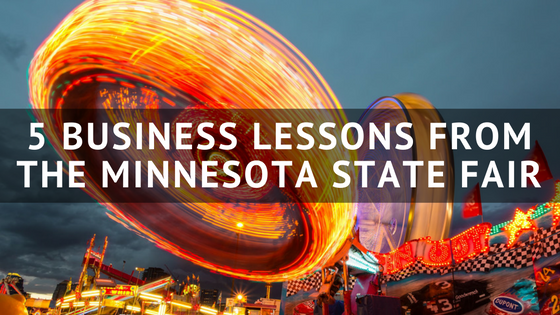 So here are the five lessons field service businesses that can learn from the Minnesota State Fair. Take time to plan out your route before you head down to the fair. First, you need to find the best route down to Saint Paul. Since the fair occurs at the height of the terrible Minnesota construction season, there will be traffic well before you even get there, so plot your route before heading down. Once you’re parked, you also should have a game plan for what booths, exhibits, and of course, food stands you want to make it to. Since the fair grounds are massive, it would be difficult to make it to each stop that you want to make it to without proper planning. That is why you should map out your route using the State Fair app before(much like using field service software to help with routing), so you know the exact route that you should take to make it to all of your stops. The State Fair can be expensive. Between the tickets, food and attractions, you can wind up spending a lot more money than you expect. That is why you should set a smart budget for your trip out to the fair. As with running a business, there are expenses that might be unexpected, so you need to be prepared and save when you can. Don’t spend when you don’t need to. Maybe forego the deep fried pickle for an extra serving of cheese curds. Maybe instead of riding the Zipper, spend a little extra for the bucket of Sweet Martha’s Cookies. When planning, do your best to come up with a realistic picture of your upcoming expenses. No joke. Field service professionals are often working outside in the sun all day during some of the hottest days of the year. Late August heat, plus fried foods, plus hundreds of thousands of people in a confined space typically doesn’t make for wonderful results. While there are First Aid tents around the fair, you don’t want to spend valuable time being nursed back to health. Be prepared and drink plenty of fluids so you’re ready to handle the elements (and plenty of deep fried foods on a stick). Like most state fairs, Minnesota’s got its start with education. There are booths in the 4-H building dedicated to agriculture and farming, manufacturers displaying their machinery and much more. Take time to learn what’s new. It can be fun walking around and learning about the latest and greatest technology and products. Just like being a fair-goer, if you own, operate or work at a field service business, you should take the time to learn about what is up and coming and what innovations might make your life easier. Finding a new technology that can streamline your business or new style of equipment can shave some time off your operations could make your business more profitable. Take time to relax and enjoy it! When most people walk through the gates of the fair, it is like they're being let loose for the Kentucky Derby. It is a mad dash to the first cheese curd booth they can find and it is off to the races the rest of the day. But that is a good way to get burnt out. Take some time to relax. Even though you might be at the fair for just one day, do what you can and save the rest for another year. With many field service businesses, you might feel like you need to get as much done within the short season. But you can’t burn yourself out easily with seasonal work. Make sure you set aside some time for relaxation. Want to see how HindSite Software can help you with routing and budgeting? Watch the demo below and see how we can grow your business!